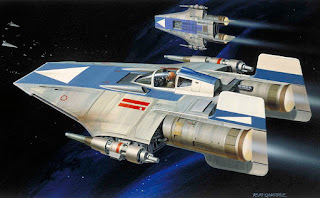 To go with my recent R2-D2 and BB-8, my client also asked for a 1/72 scale A-wing. 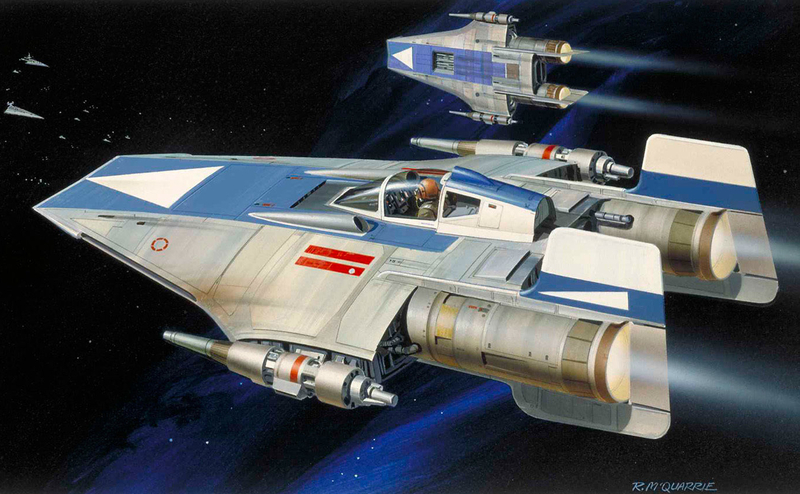 After talking over the paint job, we decided to go with the blue and white color scheme seen on the original Ralph McQuarrie concept art. The base color is a custom mix of Tamiya Flat White (XF-2), Neutral Grey (XF-53), and Deck Tan (XF-55) over a German Grey (XF-63) preshade. I was hesitant to use the panel line preshade technique because it isn't the most realistic, but since this is an imaginary ship I decided to go ahead and do it. After the base color was down, I went around and picked some panels out and sprayed them with various Tamiya and Mr Color grays, similar to the studio model. The blue areas were primed with white, preshaded with NATO Black (XF-69) and then given a coat of Flat Blue (XF-8) and Flat White (XF-2) mixed 6:1. I painted a few panels with some different blues for a little variation. All of the pure white areas (the triangle, the tops of the vertical stabilizers, and the rear of the cockpit) were painted with Flat White (XF-2) and the red stripes were painted with a mix of Flat Red (XF-7) and Hull Red (XF-9). After a coat of Alclad Gloss Klear Kote, I added all of the kit-supplied decals. These little decals are pretty nice and add a little bit of detail to the model. Bandai decals are a little on the thick side but respond well to MicroSol and MicroSet. The decals were sealed in with another coat of Gloss Klear Kote and some washes were added to add some depth to the panel lines. I used MIG Neutral Wash for the white/grey areas and MIG Dark Wash for the the blue areas. This also brought out the fantastic rivet detail that is present on all of the panels; the end effect is really quite nice. After the wash dries, everything will be sealed in with a matte varnish and I'll move on to more weathering!